Fiji Airways managing director/chief executive, Andre Viljoen, has appealed to the trade partners and stakeholders in Singapore to explore investment opportunities in and with Fiji. He made these comments on Wednesday night at the Pan Pacific Hotel during an event held to welcome the inaugural Nadi-Singapore-Nadi twice weekly flight. “This strategic development of Fiji Airways flying to Singapore will be more than just bringing tourists,” Mr Viljoen said. “We are looking forward to bringing a very important trade link and commercial development that Fiji will also experience. “I would like to appeal to trade partners here today – please come to Fiji – we are happy to provide familiarisation experience – come and experience it. Unfortunately the inaugural flight from Singapore to Nadi was postponed yesterday following the bad weather conditions as a result of Cyclone Zena which was affecting the country. Mr Viljoen further highlighted: “We all know that Singapore is one of the world’s tremendous hub and economic powerhouse. “56 million people go through Changi Airport yearly; it is no question what this offers for the tourism potential for Fiji. 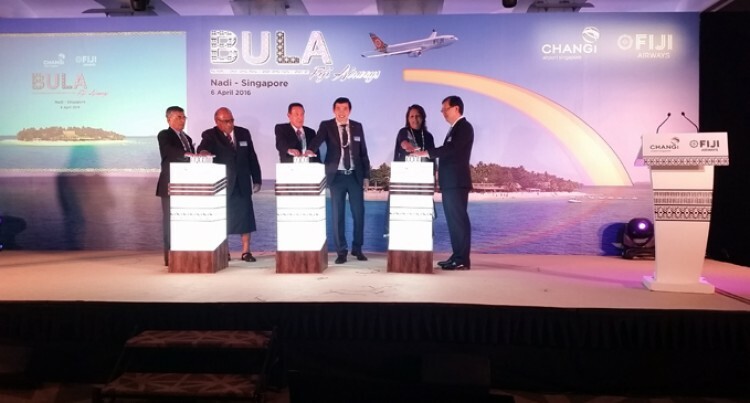 Meanwhile CEO of Changi Airport Group, Lee Seow Hiang, said: “Fiji Airways new service into Changi marks a new milestone for us as it connects Singapore to the heart of the South Pacific in Nadi. “Fiji Airways presents seamless connections for us to certain other South Pacific destinations such as Samoa, Solomon Islands, Tonga, Vanuatu, Last year Fiji received over 750,000 visitors. That represents a big growth over the preceding year.